First off, I'd like to thank all of you for your wonderful comments on my Today I Leapt entry. I really appreciate all your well wishes and encouragement. Things have been a bit slow in the two weeks since I quit my job. I knew I would need time to decompress, and have been laying low, mostly on purpose. But I'd like to share my simple joys of these two weeks with you. I happened upon James and Fiona sitting tucked up right next to each other this morning. This is noteworthy enough. They do like each other more than any two cats I've ever had, but Fiona really likes her personal space. As in a lot. As in "It's mine, all mine." Ahem. But not only were they sitting so close, James was grooming Fiona, licking her forehead. That never happens, so I went to grab my camera, but by the time I got there, James was like "Huh? Wassup?" and I didn't get the shot. I do love what I captured, though, with James blurry while turning to look at me and Fiona crisp and composed. As usual. And, in case you were wondering, one man's trash really is another woman's treasure. I'm an avid garage saler who has been getting really antsy by the lack of garage sales since before Thanksgiving (you think you're ready for spring? 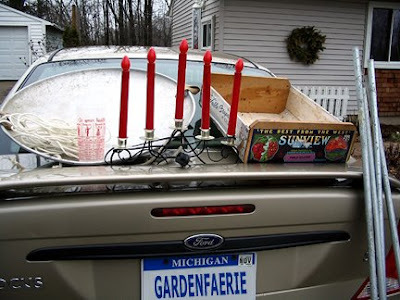 Try being an avid gardener and yard saler in Michigan. Bananas!). Anyhoo, I went to an estate sale in Ann Arbor this morning, and got the things on display on Sandy (my car; the vanity plate is Photoshopped). From the left, that's a retro-cool aluminum sled, complete with original leather handles and two holes for a rope to pull the sled. Only I'm going to use it (with the new twine resting on the sled) to pull heavy garden items (bags o' mulch and gravel, transplanted shrubs, etc.) easily across the lawn without using the wheelbarrow or tarp. Because my lot slopes and the grass is a bit bumpy (lots of tree roots), the wheelbarrow tends to tip when fully loaded. Plus, it's hard lifting heavy or bulky things into and out of the wheelbarrow. I had successfully dragged such items using a huge tarp, but I really like the idea of a sled, with an actual grip to pull. And I love retro things, so so much the better. Next, we have a really cute frosted glass (with pour spout!) that has recipes for various mixed drinks and the words "To Your Health!" I absolutely love it. 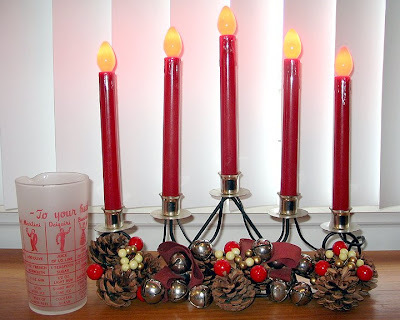 And I found this really cool holiday candelabra from the 60s or early 70s. Don't my retro pine cones and bells look perfect at the base? Going back to the car photo, there's an older wooden box that once held grapes that will soon serve as my elevated salad box (to grow lettuce up and away from groundhogs) and four very sturdy metal poles that will stake some of my tomatoes. The poles even have one end cut diagonally to make them go into the ground more easily. And all that for just over $10, which is what the sled alone would have cost, had I found a new one. Yippee! The other day, one of the two seed swap envelopes I sent off back in January came back to me. Oh boy, oh boy, oh boy! 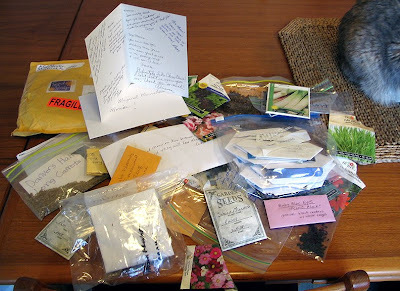 It was so exciting getting new seeds in the mail, plus the nice swappers got me a card that they all signed (so sweet!) and which was addressed to "magical, marvelous Monica" (the wording of which I ate right up!). And the eagle-eyed among you (or those who figured out you can click on this image to make it bigger) may notice Fiona's rear-end in the photo. She had hopped right onto the table and headed for the cat grass seeds, but was out of position when I was ready to take the photo. She's definitely her own cat! I picked out some seeds for myself, and it was fun Googling some plants I didn't know (Texas mountain laurel, Texas star hibiscus, Mexican mint marigold, etc.). I will donate what I can't use to a local community gardening group. The swap was so much fun, I'll do it again next year, so remember to save your seeds! My first amaryllis bloom, which was just a bud for GBBD, is starting to open. Cool! And, here's a gratuitous photo of the leaves of love in a mist. Marnie had asked about growing it and I explained how much I liked it, how it was ridiculously easy to start from seed by direct sowing (I don't even cover the seeds with soil, I just throw them down! ), and how it sometimes blooms twice for me in a season. Once in very early summer from last fall's seedlings, and a bit later on from the seeds of the earlier plants. 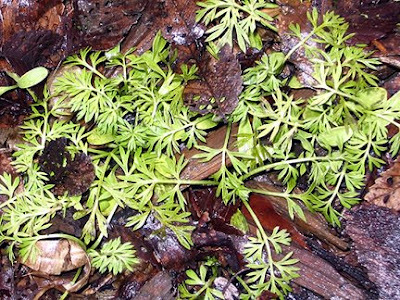 And even though it's an annual, its leaves are evergreen, as seen today in my garden (the snow has just melted due to lots of rain). Noogie! The only bad thing about love in a mist is that I tend to start singing "love in a mist" to the tune of "Love is in the Air," which isn't even a song I like, only in a more lounge singer-y way. "Love in a mist, everywhere I look around (round round round). Love in a mist, every sight and every sound (sound sound sound)..."
Thanks for your post. I've been thinking about you. :-) Fun to read about your garage sale finds (and your cats!). Fiona sounds so much like our Toby--you don't invade his personal space, either, unless he wants you to! I'm not into garage sales anymore, but I think you got some great finds. And thanks for the tips on the love-in-a-mist: I received some seeds from another blogger, and now I'll wait to sow them directly outside. Thanks for sponsoring the seed exchange--Beckie and I had so much fun going through all the seeds. I'll be sure to save more this summer! Hey Monica, thank you. I would not have thought even a hardy annual could survive a northern winter. I should have planted seeds last fall so they were ready to come out strong this spring. Now I know and will do it from this season on. 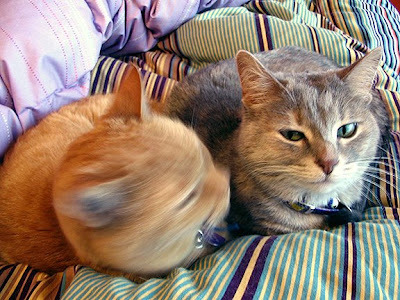 I love your cats. James looks like he's doing a double-take. I miss garage sale-ing too. By the time I get off work, all the good stuff is gone;) Have a great weekend. Oh great, now I'll have Love is in the air on my mind all day. lol Great you got some buys at the estate sale. And I really enjoyed the seed swap. It was so very nice of you to host it! Monica, we had to put the bitey on mom 'cos she didn't tell us you quit your job!!! She was mumbling something about 'must have missed the post, blogger acting up', etc. How thoroughly exciting!!! All the best for this sabbatical, what a courageous step. You are so cool! Hi James & Fiona, nice to see you two around. A most fine pair of puddy tats Monica. We have car boot sales over here - lots of folks converging on muddy fields selling from their car boots :) What a great haul - that box will be ideal for lettuce and didn't you do well in the seed swap :) Happy sowing ! Ooh you & my grandmother would be fast friends. We both garden but she is a garage sale fiend & always finds the best stuff. Looks like you made out like fin on your latest hunt too. The sled will be an interesting addition to your gardening arsenol! Nice haul Monica! Great idea for the sled. There's a really cute little antique store in a ramshackle old, old cabin on the way to my Mom's house. When I hit it at the right time (their hours are very limited,) I always find cool stuff very cheap. Good idea using the box for lettuce. Fiona and James are cool cats and seem like they'd be great for comic relief! Monica, It is great to see the seeds back with you. What a great time that was. I will try to get a picture up of the Texas Star hibiscus. I posted pictures of my tomato babies today. You had me going with the vanity plate. Can you guess what mine really says? Lucky you on all your finds. FYI, the Texas mountain laurel seed is deadly if swallowed. Watch your kitties. Excellent buys all and fess up, you are going to use that sled to go wheeeeeeeeeeeeeeeeeeeeeee down a slope when there's snow, aren't you? Have to lie down now, all this posting of yours is such a shock to the system. What fantastic bargains you bought. I love the sledge, and what a great idea to use it for transporting heavy stuff around. Last year my husband bought me a motorised wheelbarrow and it's the best present ever, although I tend to overload it when I'm weeding and then they leap out on their way to the compost heap! Seed swap, what a great idea. 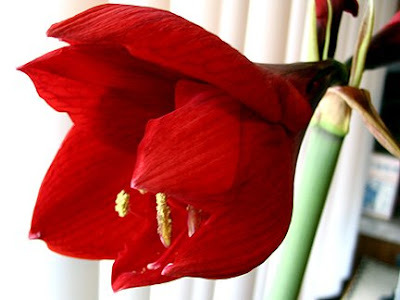 I love the deep red of that amaryllis. We have managed to keep several bulbs for a few years now and they keep on blooming. Stunning. I really dig your sale finds! The sled idea is genius BTW, I've used tarps and even my own old plastic roll-up sled, but stuff doesn't stay on it well. The round one is perfect!